It is housed in a transparent plastic case, allowing the action to demonstrated with the help of a rubber bellow. The dial is 100mm diameter. A) Aneroid Barometer :- 4 (100 CMS) Indian make with base. B) Aneroid Barometer :- 4 (100 CMS) Indian make with base. 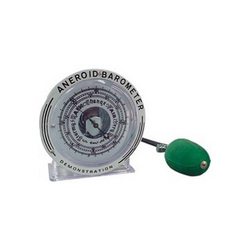 Backed by in-depth industry knowledge, we are engaged in manufacturing and exporting Barometer Aneroid. These aneroid are offered with 100mm dial graduated 28 to 31 inch of mercury and 960 to 1060 mill bars with plated bezel, cover transparent and index 16cm diameter approximately. Our customers can buy these instruments at industry leading prices from us. With our expertise and trustworthiness, we are engaged in offering an optimum quality range of GPI Aneroid Barometer. We are offering a wide gamut of superior quality Barometer Aneroid to our clients. Dial 100mm diameter, dual scale, range 940-1060mbxmb figured in black, and good quality movement mounted on hard wood/ plastic frame 165mm diameter, with glass in anodized bezel. With lug for rear mounting. Dial 100mm in diameter, dial scale 960 to 1060mb (28-31 in x 0.10 in) figured in black, good quality movement mounted in a polished plastic frame 155mm diameter with glass in anodized bezel with lug for rear mounting. We are the manufacturers of Aneroid Barometer Wall Type , 100 mm dial graduated from 28" to 31" and 940 to 1040 millibars with an index pointer, with transparent top cover, mounted in plastic case 160 mm diam. approx. This Barometer is Hanging on Wall Type with front glass Diameter 10cm representing the rain, stormy weather, Dry & other conditions. It is Made as per Original ‘Sundo’s’ Technology of German. Usage: For educational demonstration purpose only. 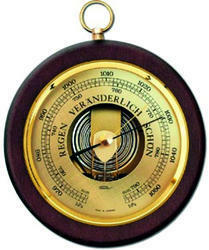 Our organization provides a superior range of Solid Mahogany Aneroid Barometer to our clients. Aneroid Barometers which are precision quality with fine workmanship reading & indicating instruments for measuring absolute atmospheric pressure of 710 mm Hg – 790/800 mm Hg and 940 – 1070 mbar, available in 100 mm Dial also in 130 mm and 160 mm with Mahogany Wooden body frame.